Kern County Employees Federal Credit Union (Currently Strata Credit Union) was established in February of 1949 by a small group of five county employees looking for a better way to save, borrow and invest their money. Employees pooled their savings account funds together and used this capital to make loans to their co-workers. At the time, business was conducted on Saturdays or evenings after work, in the board chairman’s kitchen. Loan decisions were made based on a member’s career stability and income. The first “mobile branch” was the trunk of a Sheriff’s patrol car. 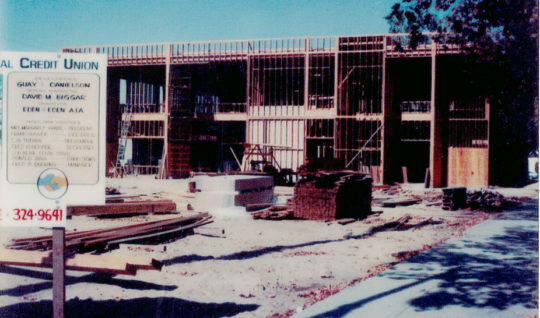 In 1979, the Credit Union had grown sufficiently to open a large modern branch at 1717 Truxtun Ave, the current site of its downtown branch and administrative center. In 1984, Kern County Employees Federal Credit Union officially changed its name to Kern Federal Credit Union to reflect a broader membership base that included immediate family members of County employees and employees of several other local businesses and government offices. The mid-2000’s brought explosive growth. In 2005 changes to Federal regulations allowed KFCU to operate under a “community charter” meaning that anyone who lives, works, or attends an educational or religious institution within Kern County would be eligible for membership. This change offered much opportunity for KFCU and the community at large. In 2018, Kern Federal Credit Union changed its name to Strata Credit Union in an effort to eliminate years of name confusion with other similarly named organizations in the marketplace, and to prepare the organization for future growth. We are very excited about our new name and the future of our credit union. This change is one of many steps we are taking to position the credit union for sustained, healthy growth for the next 70 years and was not a result of a merger or acquisition. By selecting our new name, we have made an investment in our future. We believe “Strata” provides a foundation for growth in the years ahead. Strata Credit Union members have access to branches in downtown and northwest Bakersfield, 24/7 Member Service online or over the phone, online and mobile banking and thousands of ATMs nationwide. We take pride in our commitment to service and our goal to improve the financial wellbeing of every member.